The beauty of a blog is that you are flexible. We don't have to chase after popular trends, or the news of the day, or what some people consider "interesting." Rather, one can pause from the hustle and the bustle of this hustling, bustling world and focus on what is truly important, unencumbered by extraneous demands of bosses and the fickle marketplace. Perhaps the most well-received feature I've had on Everygoddamnday.com was last January when, in conjunction with the Chicago International Puppetry Theater Festival, I presented seven full days of Puppetry Week, and like to think that I participated in the festival's success, and, indeed, consider myself responsible for it. Some readers, true, groused a little, at first, before they got into the spirit of the thing and became enthusiastic, nearly. The overwhelming response was positive. "Very good article! We are linking to this particularly great content on our website. Keep up the good writing. Also visit my webpage," wrote one reader. "Just want to say your article is as surprising. The clarity in your post is just cool and i can assume you're an expert on this subject," wrote a second. "It is in point of fact a nice and useful piece of info. I am glad that you shared this useful information with us. Please keep us informed like this," gushed a third. Well, you get the idea. Given the reader demand, and my own inexhaustible interest in the history, lore, science and philosophy of the puppetic arts, not to mention the National Puppetry Festival, which is coming this August, I felt morally obligated to designate all of April as Everygoddamnday.com's 1st Annual Puppetry Month. As for those who wonder if there are enough puppet-related stories to fill a month, believe me, the challenge was to limit myself to only 30 posts. 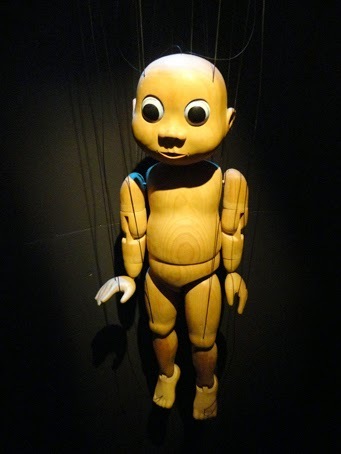 As my Facebook friends know, Edie and I visited Brúðuheimar, or the Centre for Puppet Arts in West Reykjavik in February, and so I'll kick off Puppetry Month with a bang with three days on Icelandic puppetry, including an interview with Bernd Ogrodnik, the center's founder and master puppeteer of the National Theater of Iceland. The first week will be rounded out with looks at the exciting puppetry being done in the three Scandinavian nations: Finland, Norway and Sweden. Then from overseas to our home of Chi-town, focusing on the vibrant local puppetry scene. First the recent controversy at the Chicagoland Puppetry Guild related to whether marionettes should be said to have "strings" or "lines"—I'll call it as I see it!—plus profiles on significant Chicago puppeteers, both of today and in years past. I should also point out—and this is a complete coincidence, I assure you—but Every goddamn day is proud to be sponsored through the generosity of The Puppet Store, the Internet's premiere puppet location, with a full line of glove puppets, full/half body puppets, marionettes and realistic animal puppets, plus puppet accessories, including the hard-to-find puppet wheelchair. I hope you will turn to them for all your puppetry needs. You can access their web site by clicking here. Later in April, there will be backstage visits to Opera in Focus, the marionette opera in Rolling Meadows, plus lots of other surprises. Take a look at the entire month's schedule. Thanks everybody, as we set off on our puppeterrific adventure together! Delightful news. Is there a chance you could squeeze in a piece on puppetry in San Seriffe? The puppetry done there is truly a work of imagination. what the hell are you talking about, a n a? AGAIN with the puppets? Turn to The Puppet Store for ALL of our puppetry needs? Happy April Fool's Day to you as well! Funny! And we got to enjoy an extra column in the paper as well. The drawback is, I plan to run it here tomorrow. But I'll add some introductory remarks, so at least something will be fresh about it. Oh, Oh, is there the possibility you could do a column on Mike Pence (or Rahm, or Scott Walker, or Chuy, etc. ): Puppet or Marionette? That was great. Very aware of today's date so I gleefully clicked the links and was not disappointed. Thanks. Hard to fool people nowadays. I figured, "Go with the nearly believable." Ha ha, not normal for a grown man to be so into puppets. By the way good article in the paper Wed. Just saying go find another bakery, isn't the point. Given that Good Friday is two days away, a tangential tie-in for your month-long festivus. The conclusion of the dramatic song "Trial Before Pilate" from "Jesus Christ Superstar". "Don't let me stop your great self-destruction. Die if you want to you innocent puppet!" Too much for a fun, April Fool's post? Hey, whatever one's position with regard to Christianity, that's a heck of a show/album/movie. How about admitting the Jewish rabbis were threatened by Jesus and his non conservative ways, and don't blame it all on the Romans? That's not anti-Semitic, just fact that Hollyweird doesn't want mentioned? No, I'm not a born again. It isn't right, but it sure got the Jews a big peck of trouble ever since. @Jakash: I didn't know the Easter Story until I saw Jesus Christ Superstar; @Anonymous: are you reacting to something I, or anybody, has written, or just spouting stuff that's in your head? I'd say that the peck of trouble was something your forebears decided upon, not something that was earned. Not a fair comparison. Your parents had better stories to tell. Do you mean Jews now, or Jews in Roman times? If the former, I doubt you could provide an example of Jewish hatred toward Jesus--just something you said, unthinkingly, perhaps because it made sense to you. If the latter, you might have to look how easily your fellow Christians accept ideas and lifestyles not their own, and it might give you a hint on why Roman-era Jews didn't give Jesus the reception you think he deserved. And the whole world is going secular. Sorry to be the one to tell you. I'd like to see you write an article or blog here for once, ripping on orthodox jews for a change. Are Orthodox Jews passing laws to allow their bigotries to be given free rein? When that happens, I'll rip them. In the meantime, I'm sure you're doing a fine job ripping people not yourself. Why try to lure in amateurs? I'll leave hate to professional haters. I suppose you forgot how they wanted to control seating in an airplane, very sexist , can't be by women and it happened more than once or in Brooklyn can't have a lady busdriver or women have to sit in back . Maybe not on large scale but they affect too. I'm not a hater. Muslims are worse than women and some born agains sexist too. I have a close Reformed pal and they don't like hassdics themselves and Hassidics don't like them. "Control seating on an airplane" is not pass laws in the general assembly so I can better shun you in my place of public accommodation. "I'm not a hater" would only mean something if there were anyone in the world who would admit otherwise. Enough. You're commenting on the funny puppet post, remember? Time to move on. Wait. You left Chicago in February to visit Iceland?